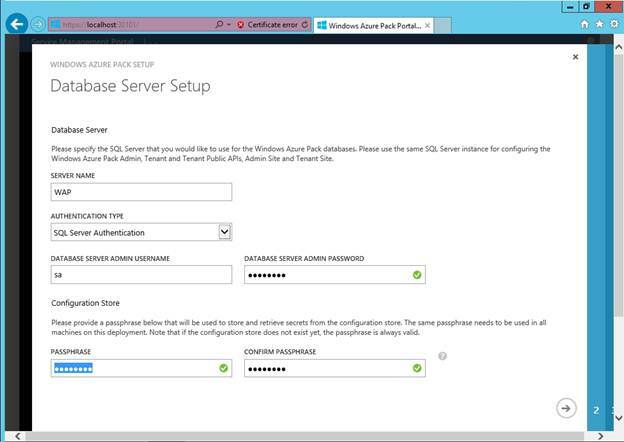 In my previous article, I showed you how to get SQL Server configured in preparation for installing Windows Azure Pack. 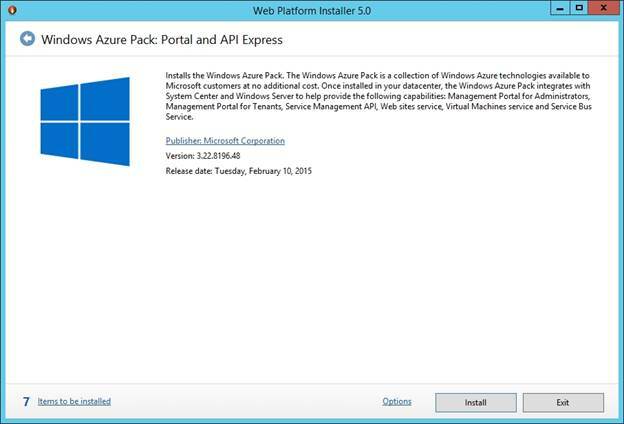 In this article, I want to continue the discussion by showing you how to install Azure Pack. Part of the configuration process is going to be Web based, so you should go ahead and disable Internet Explorer Enhanced Security Configuration if you have not already. If you are using the Windows Firewall, it is also a good idea to make sure that it is not blocking access to your SQL Server instance. Begin the deployment process by double clicking on the file that you previously downloaded. This will cause the Web Platform Installer to be installed (if it isn’t already). When prompted, simply click the Install button to install the necessary components, as shown in Figure A. Figure A: The Web Platform Installer needs to be installed. At this point, you will be prompted to accept the license agreement. Upon doing so, you will be taken to the Prerequisites screen. At first, the Continue button will be grayed out. To make the Continue option available, you will need to scroll down and then choose whether or not you want to use Microsoft Update to check for updates. Upon making your selection, click Continue. 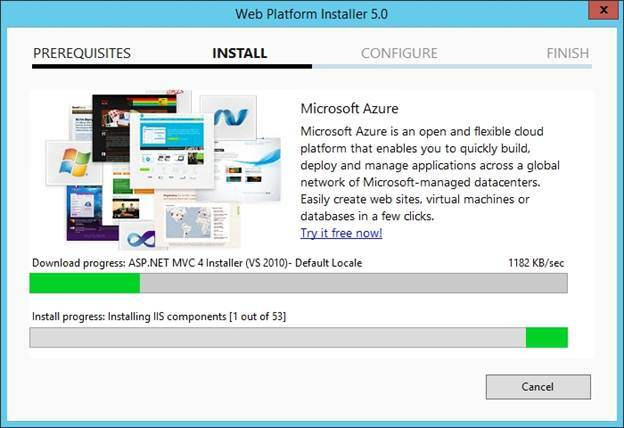 The Web platform installer will now install the necessary components. This can take a while. If you look at Figure B, you will see that there are 53 components to be installed. The nice thing about this process is that the necessary IIS components are installed for you. This means that you won’t have to worry about installing these components manually. Figure B: It takes a while to install the 53 required components. When this process completes, you will see a screen indicating that there is additional work to be completed. Click the Continue button. You can go ahead and close out the Web Platform Installer. At this point, you will see a new browser window open and point to https://localhost:30101. Internet Explorer will display a certificate error. This is to be expected since a self signed certificate is being used and because localhost is being referenced rather than an actual domain name. Click the Continue to this Website (not recommended) option. After a brief delay, you will see a screen prompting you to configure your database server. Begin the process by entering the name of your SQL Server into the Server Name field. You will need to enter the server’s name. If you are using a non-default instance, you will have to enter an instance name as well. Next, you will need to set the authentication type to SQL Server Authentication. The database server admin username will be sa and the password will be the password that you assigned when you set up SQL Server. You will also have to provide a pass phrase for the store. You can enter pretty much anything that you want as the pass phrase. You can see what the configuration options look like in Figure C.
Figure C: You are going to need to configure access to your SQL Server. Click the right arrow icon shown in the figure above, and you will be asked whether you want to participate in the Customer Experience Improvement Program. Make your selection and click the right arrow icon. You will now see a long list of features that need to be set up, as shown in Figure D. Click the checkmark icon and the features will be configured automatically. Figure D: There are several features that need to be set up. When the feature configuration process completes, click on the checkmark icon to close Internet Explorer. 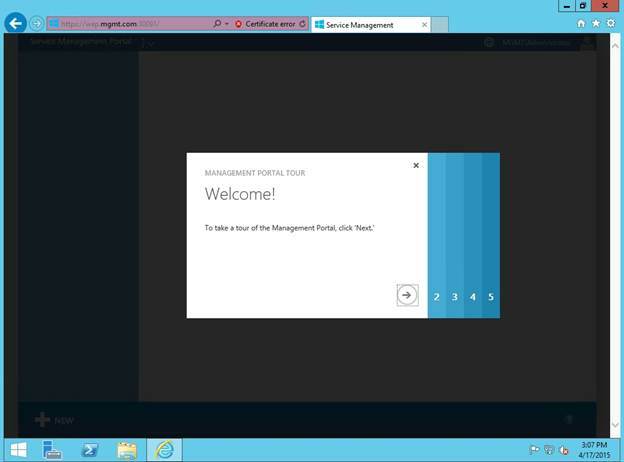 Windows Azure Pack is now installed and functional and we can verify that it is working. To do so, open Internet Explorer and go to https://localhost:30091/ and log in using a set of administrative credentials. After logging in, you should see the Welcome screen, which is shown in Figure E. This screen lets you take a tour of the management portal. You can click through the tour by clicking on the arrow icons. At the end of the tour, click on the checkmark icon. 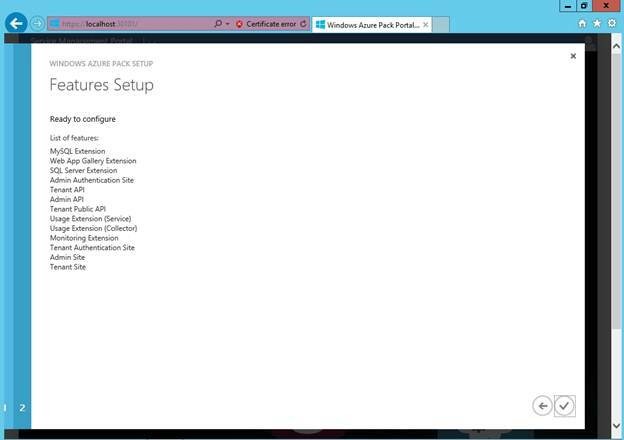 Figure E: The Windows Azure Pack provides you with an introductory tour. When the tour is over, you are taken into the Service Management Portal, shown in Figure F. As you look at the figure, there are two things that you will immediately notice. 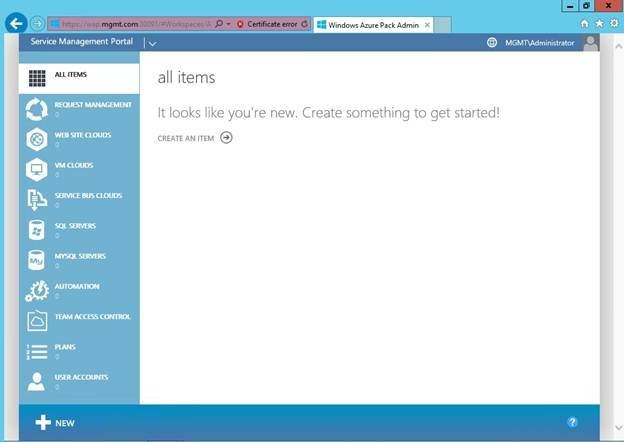 First, you will notice that the portal looks exactly like Microsoft Azure. Second, you will notice that the portal is completely empty. Figure F: The Windows Azure Pack’s Service Management Portal is initially empty. It is important to understand that all we have really done do far is to install a Web application and link it to a SQL Server database. As it stands right now, Windows Azure Pack doesn’t even know that Virtual Machine Manager exists. Before we can do anything with Azure Pack, we have to link it to Virtual Machine Manager. Before we can do that however, we have to install the Service Provider Foundation. In case you are not familiar with the Service Provider Foundation, it is a component of System Center Orchestrator. Being that the Service Provider Foundation is a System Center component, it is important to adhere to version consistency. In other words, if you are using System Center 2012 R2 Virtual Machine Manager then you should also use the R2 version of System Center Orchestrator. You don’t have to worry about installing System Center Orchestrator in its entirety. All you need is the Service Provider Foundation component. Even so, there are a couple of other things that you will need. For starters, you are going to need to create a service account. The service account can be a simple domain admin account. It is very important that you avoid using the same service account that you used for Virtual Machine Manager (you shouldn’t use your RunAs account either). Otherwise, you could end up in a situation in which the service account accumulates more permissions than what it needs in order to perform the task at hand. The result would be a security vulnerability. The other thing that you are going to need is a SQL Server instance. When I have deployed Azure Pack in the past, I have typically created a dedicated SQL server. This dedicated SQL Server contains three separate SQL Server instances. One instance is used by Virtual Machine Manager, the next instance is used by Azure Pack, and the third instance is used by the Service Provider Foundation. All three instances exist on the same server, but are independent from one another. In this article, I showed you how to get Azure Pack up and running, but right now Azure Pack doesn’t really do anything useful. In the next article in the series, I will show you how to deploy the Service Provider Foundation so that we can link Azure Pack to Virtual Machine Manager.